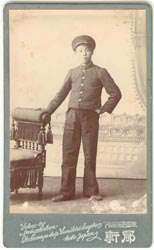 The Carte de Visite (CDV) is a small mounted photograph. Mounts generally measure: 2 1/2 x 4~4 1/2 inches - 6.4 x 9.6~11.5 cm. Photographs generally measure 2 1/4 x 3.5 inches - 5.8 x 8.8 cm. 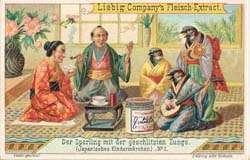 In Japan they were popular from the early 1860s through the early 1900s. 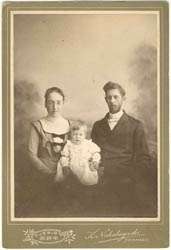 The photographs were generally albumen photographs and later print out paper (collodion silver chloride or gelatin silver chloride). 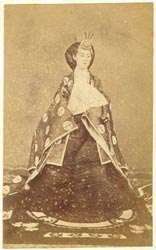 Other processes were used (collotype, daguerreotype, gravure and salted paper (calotype)) but these are generally the earlier CDV and range from hard to find to very rare. 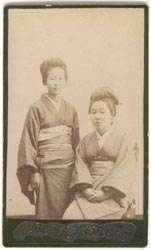 An important work by Torin Boyd and Naomi Izakura titled Portraits in Sepia from the Japanese carte de visite collection of Torin Boyd and Naomi Izakura is devoted entirely to these early images. The book is an amazing compilation of these images and the photographers who took and marketed them. For more information on this book, click here. Studio Markings: "K. Ogawa - Tokio Japan" in gilt at bottom on front. Edges gilt. Elaborate studio illustration on back. On the back at the lower right "A.L. Berlin" is printed. Studio Markings: "K. Ogawa - Tokio Japan" in white at bottom on front. Elaborate studio illustration on back. Studio Markings: "K. Ogawa - Tokyo" blind stamped to bottom right of the photograph. Front cover of the folder has a black blind stamped vignette. Manuscript presentation inscriptions above and below the photograph with the date September 12, 1915. 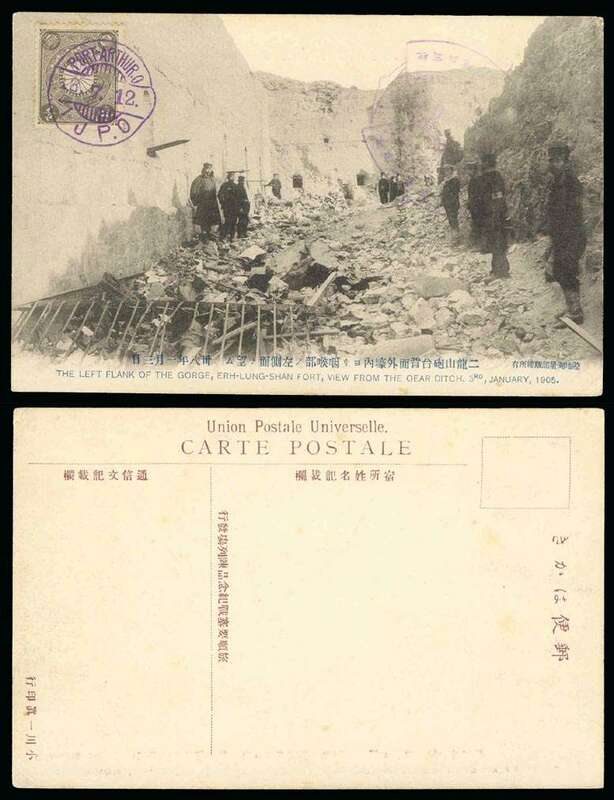 Comments: This is a Japan government issued 2 sen UPU foreign mail postal card. 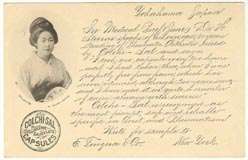 On the reverse is an advertising vignette featuring a young Japanese woman. 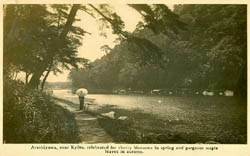 Around it is printed "Collotype - K. Ogawa, Tokyo." The manuscript message is printed, not handwritten. 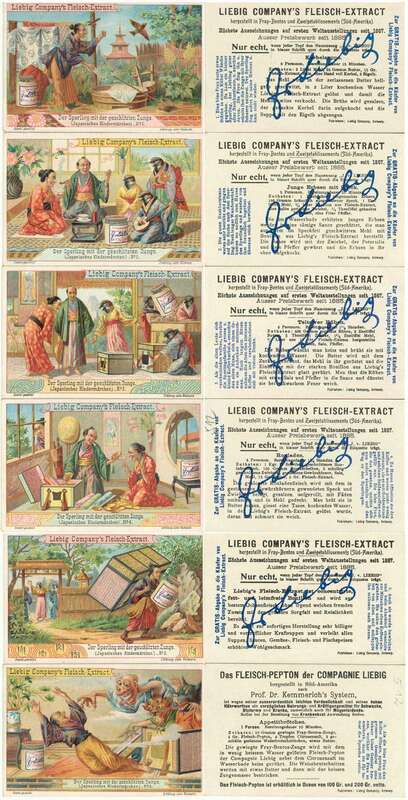 It is speculated that the New York company (E. Fougera & Co.) named on the card used the Japan mailing as gimmick to attract physician's attention to the advertising. Notice that "Yokahama" is mispelled at the top of the message. 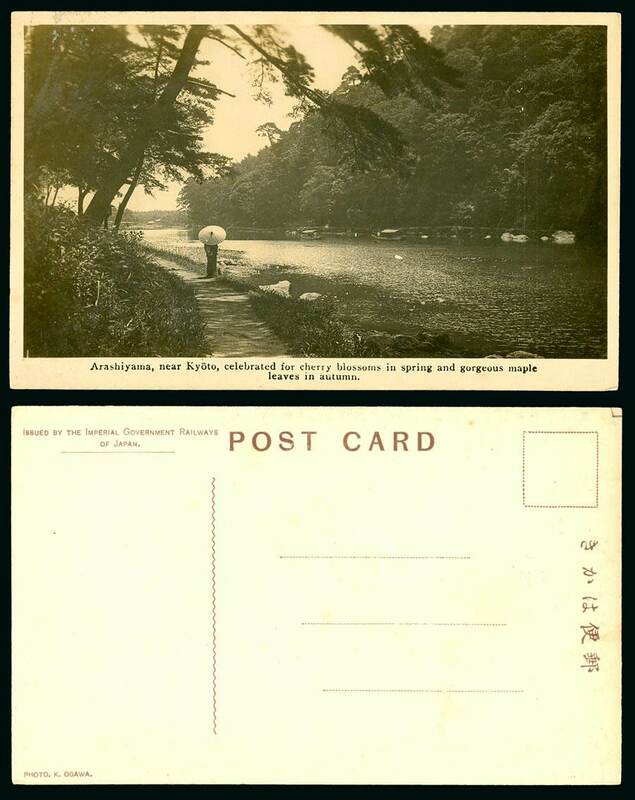 A very similar card is the subject of an article Bruce Cameron and Varro Tyler published in the June 1980 issue of Japanese Philately, Vol. 35, No. 3, pages 128-129. 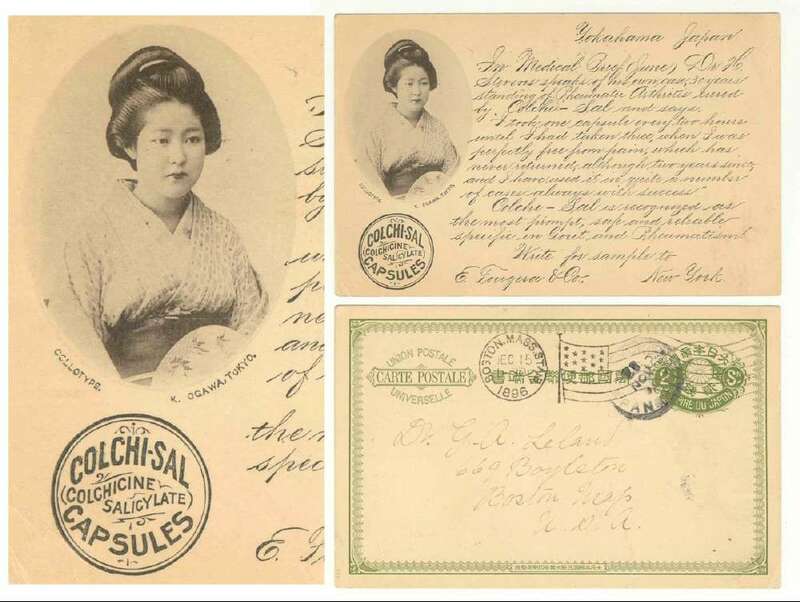 In this article it is speculated that because of the low foreign mail rate from Japan to the US and lower printing costs, cards of this type might have been less expensive for the advertiser than those printed and posted in the United States. 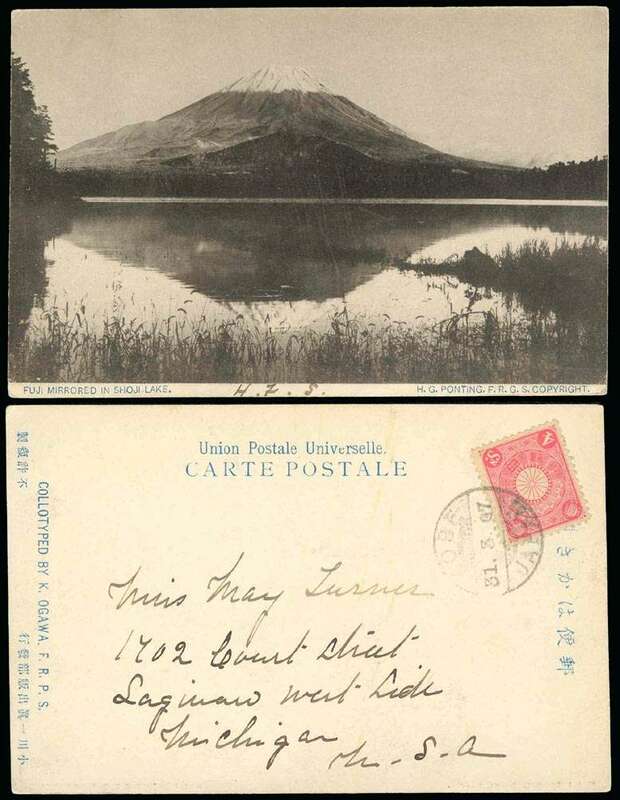 Subject: "Fuji Mirrored in Shoji Lake"
Comments: This is a picture post card featuring Mt Fuji. It is copyrighted by H.G. Ponting, the noted British photographer. Ponting spent three years traveling throughout Japan. 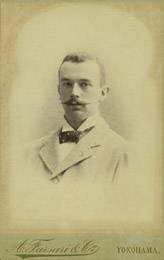 This was just prior to his travels with Scott and Shackleton in the Antarctic, as the official photographer for the expedition. 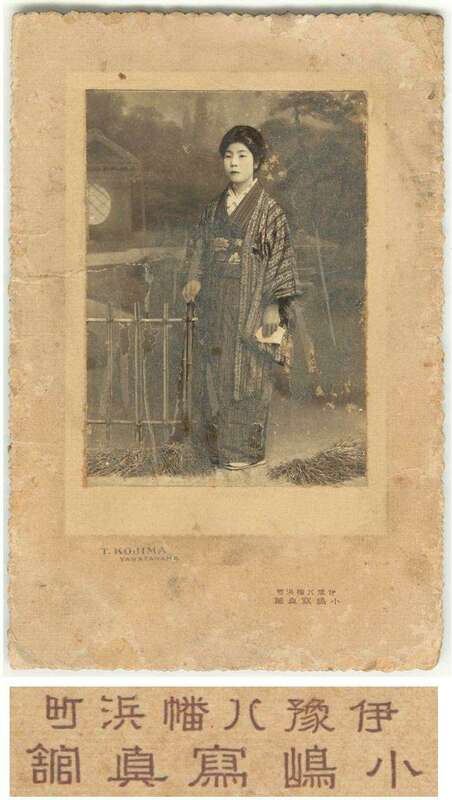 There is an English inscription on the face that reads "Collotype by K. Ogawa. F.R.P.S." Below that is the Japanese inscription that translates "Ogawa Kazumasa Shuppanbu." 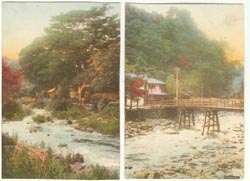 At this time, Ogawa had published two of Pointing's photograph illustrated books relating to Japan, Fuji San and Japanese Studies. 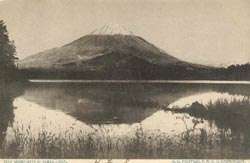 This exact image appears in the book on Mt Fuji. For information on these book, click here (Fuji San) and here (Japanese Studies). 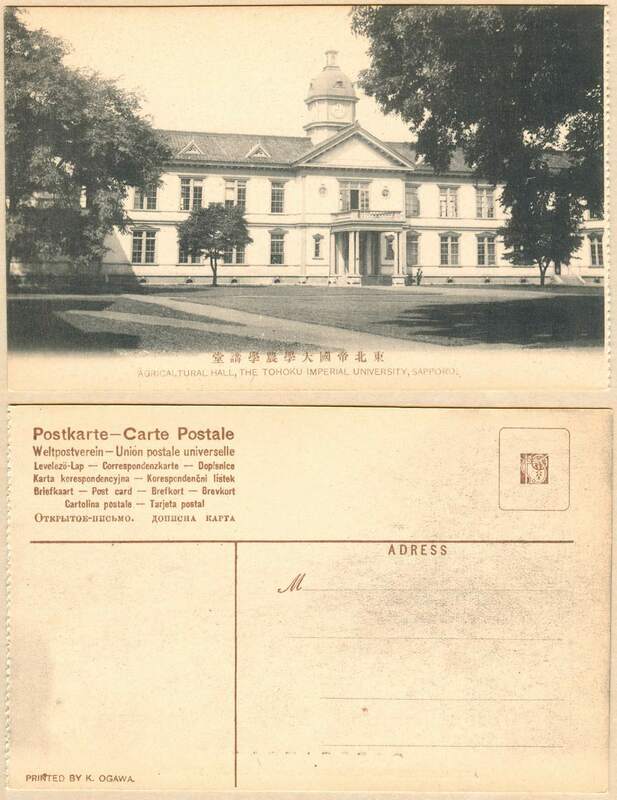 Subject: "Library, The Tohoku Imperial University, Sapporo"
Comments: Perforated along the right margin. One from a set of Tohoku University views. 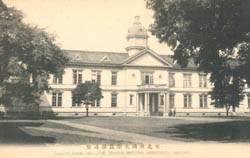 Subject: "The Office of the College of Agricalture (sp), The Tohoku Imperial University"
Subject: "Agric. 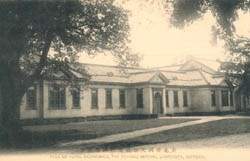 Chemical Laboratory, The Tohoku Imperial University, Sapporo"
Subject: "Agricultural Hall, The Tohoku Imperial University, Sapporo"
Subject: "Hall of Agric. 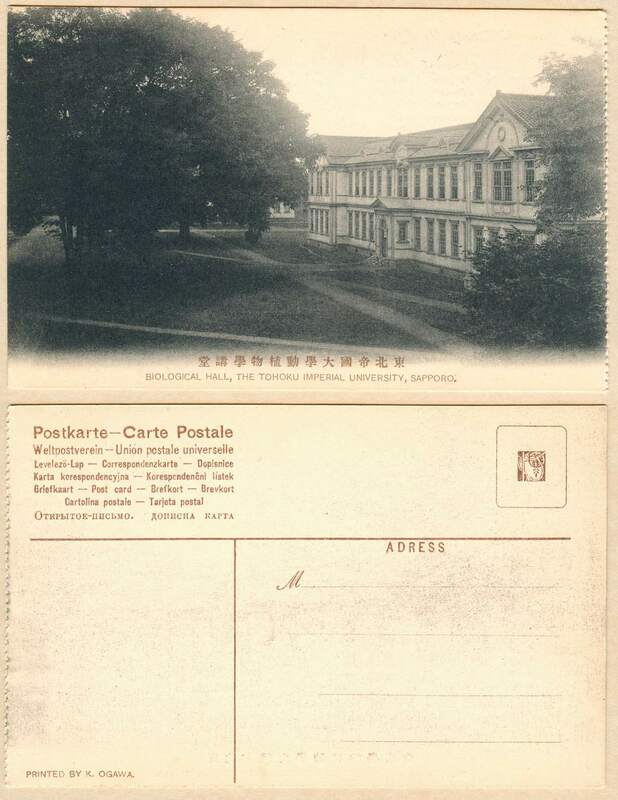 Economics, The Tohoku Imperial University, Sapporo"
Subject: "Biological Hall, The Tohoku Imperial University, Sapporo"
Subject: "Dormitory, The Tohoku Imperial University, Sapporo"
Subject: "Campus, The Tohoku Imperial University, Sapporo"
Subject: Grand Exhibition of K. Ogawa's work. 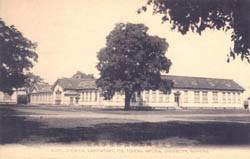 Comments: This is a picture post card showing and exhibition hall. Two columns have banners announcing the Ogawa exhibition. 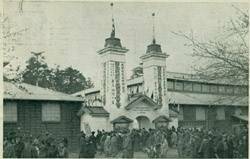 "Grand Exhibition, K. Ogawa" can be read on the banner across the entrance. The Japanese printer's inscription (message side on left edge) reads "Ogawa Shuppanbu." 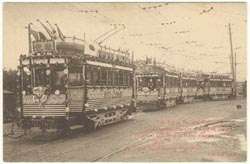 Subject: "The Tokyo Railway Company. To Commemorate the coming of Japan's respected and most welcome visitors from the Great Neighbouring Republic. 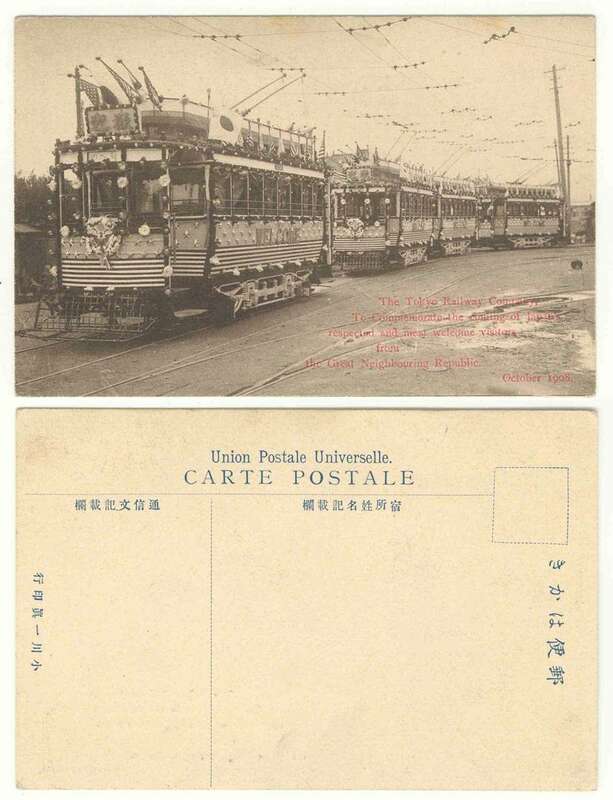 October 1908"
Comments: This is a picture post card showing trolley cards decked with flags of the visiting countries. The Japanese printer's inscription (message side on left edge) reads printed by Ogawa Kazumasa. 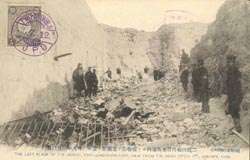 Subject: "Evacuation of Fortress Shwishiying. "BR> Condition: Fine condition. Used with Dairen 1909.8.9 cancel. Addressed to California. Comments: An image from the Russo-Japanese War. 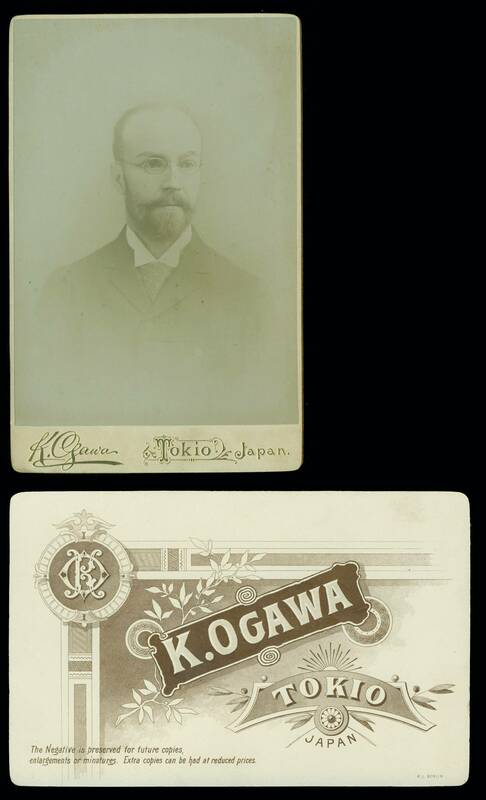 The Japanese printer's inscription (message side on left edge) reads Ogawa Kazumasa Photoengraving Company. Subject: "Evacuation of Fortress Shwishiying." Handwritten notation "Port Arthur." 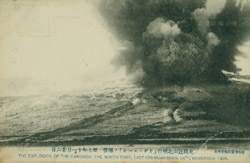 Subject: "The Explosion of the Caponier, The North Fort, East Chi-Kuan-San. 26th, November 1904." 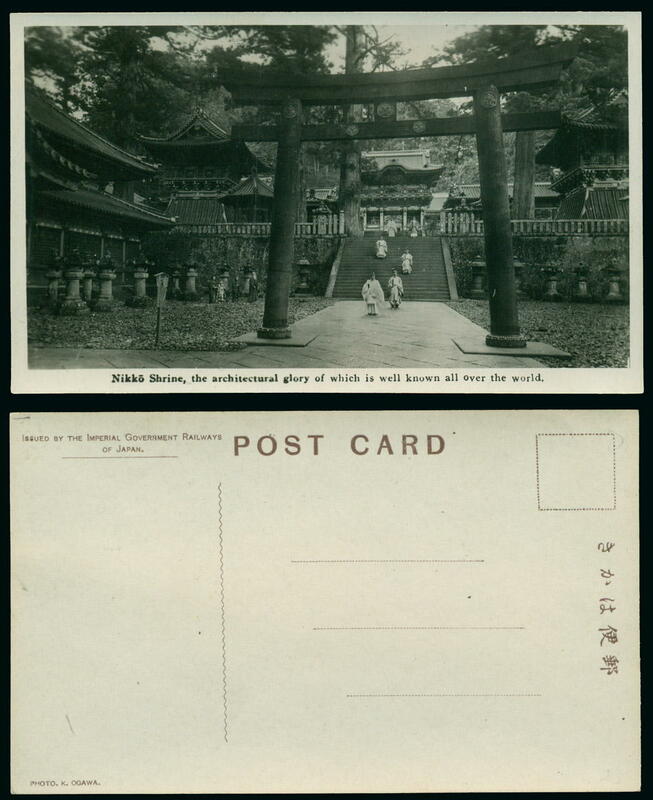 Comments: This is a picture post card featuring a scene from the Russo-Japanese War. 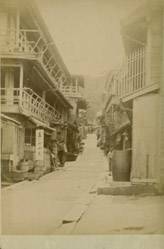 During the period from 1905-6 Ogawa published several collotype photograph albums on that war. 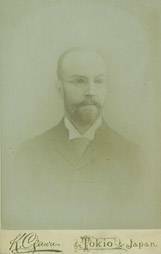 For information on the major work he published on the war, click here. 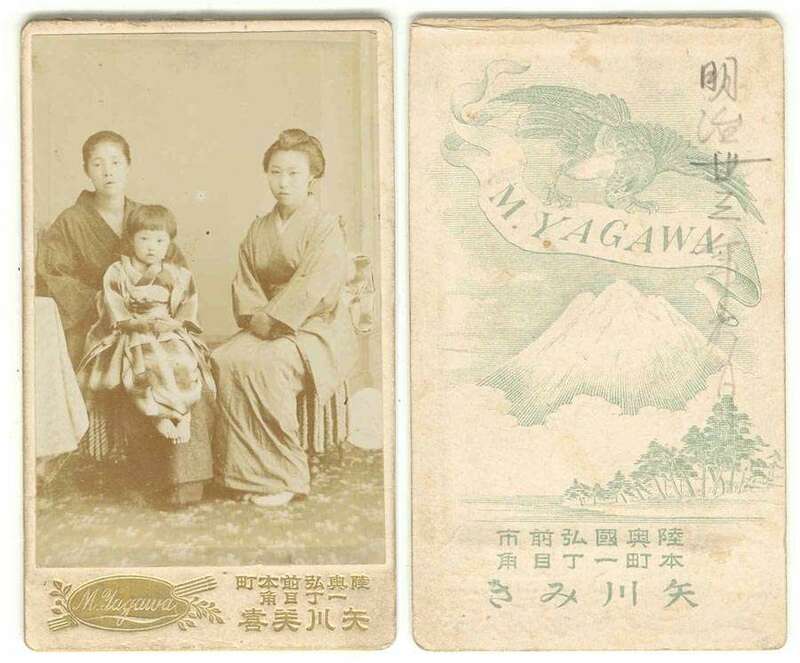 On the message side of the card there is a Japanese inscription (at the left edge) reading "Ogawa Kazumasa." 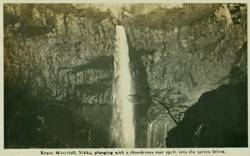 Subject: "The Left Flank of the Gorge, Erh-Lung-Shan, View from the Oear Ditch, 3rd, January 1905"
[Information on this series is here]. Subject: Folder and five picture post cards. Folder and the following five picture post cards. 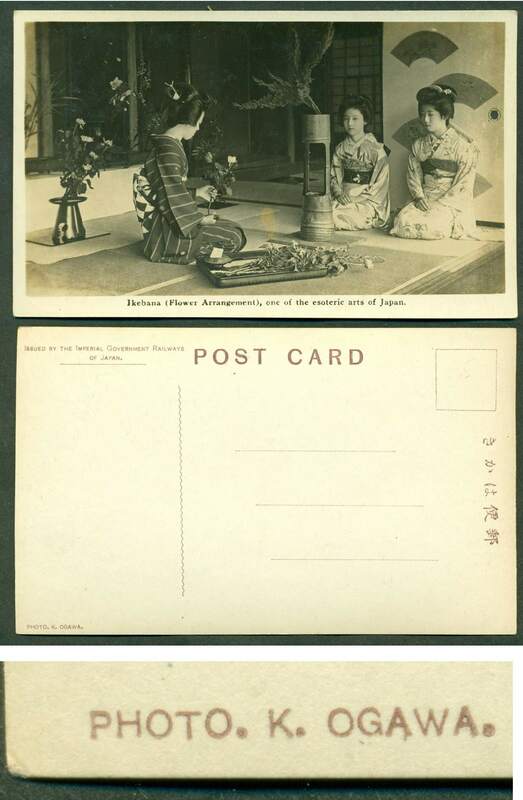 Subject: "Ikebana (Flower Arrangement), one of the esoteric arts of Japan." Comments: Three young ladies practicing ikebana. 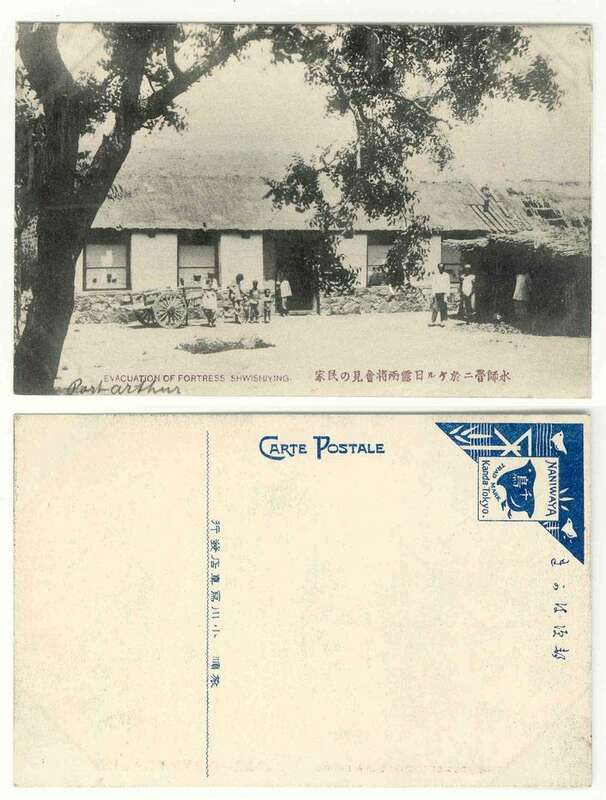 Real picture post card with real photograph ("Photo. 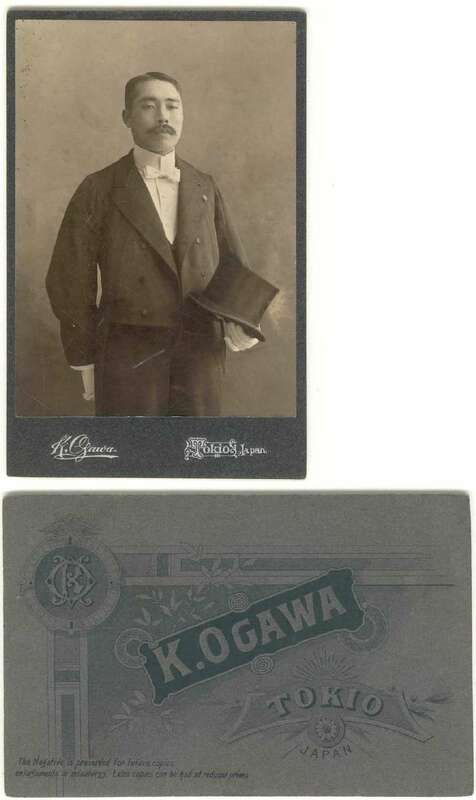 K. Ogawa"). "Issued by the Imperial Government Railways of Japan." Per the series folder, this is picture postcard number 3 (of 5) from set number 3. Comments: Three young ladies practicing ikebana. 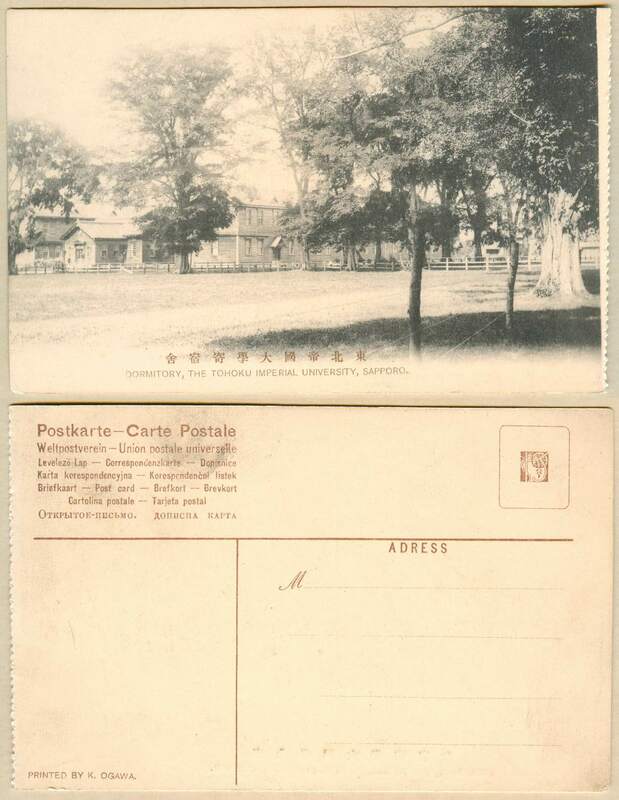 Real picture post card with real photograph ("Photo. 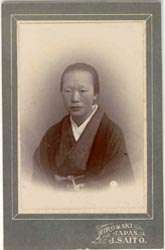 K. Ogawa"). "Issued by the Imperial Government Railways of Japan." Per the series folder, this is picture postcard number 3 (of 5) from set number 3. 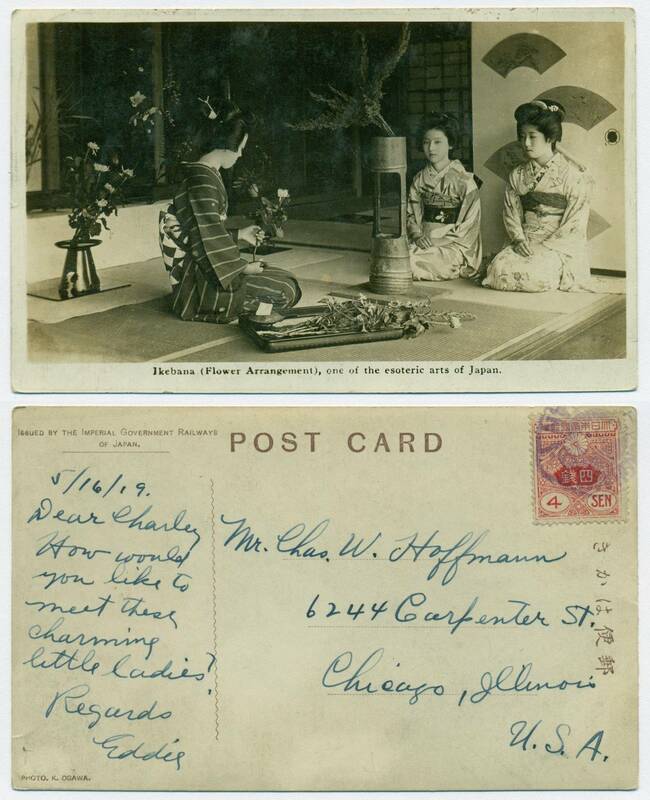 The card is used (addressed to Chicago) and has a message dated May 16, 1919. 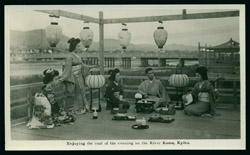 Comments: Features a scene by the river in the Arashiyama area near Kyoto. 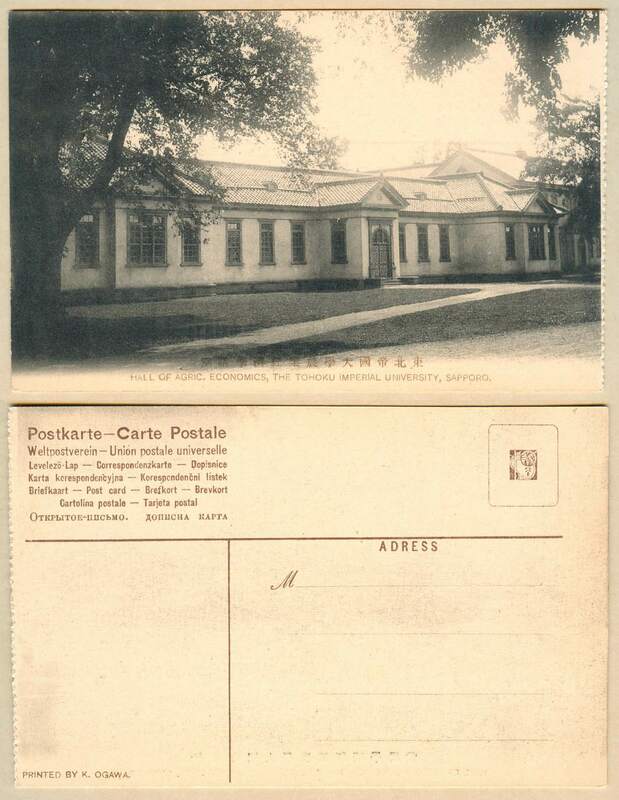 Real picture post card with real photograph ("Photo. 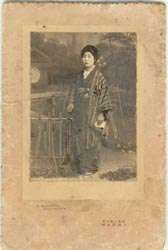 K. Ogawa"). "Issued by the Imperial Government Railways of Japan." Per the series folder, this is picture postcard number 1 (of 5) from set number 6. 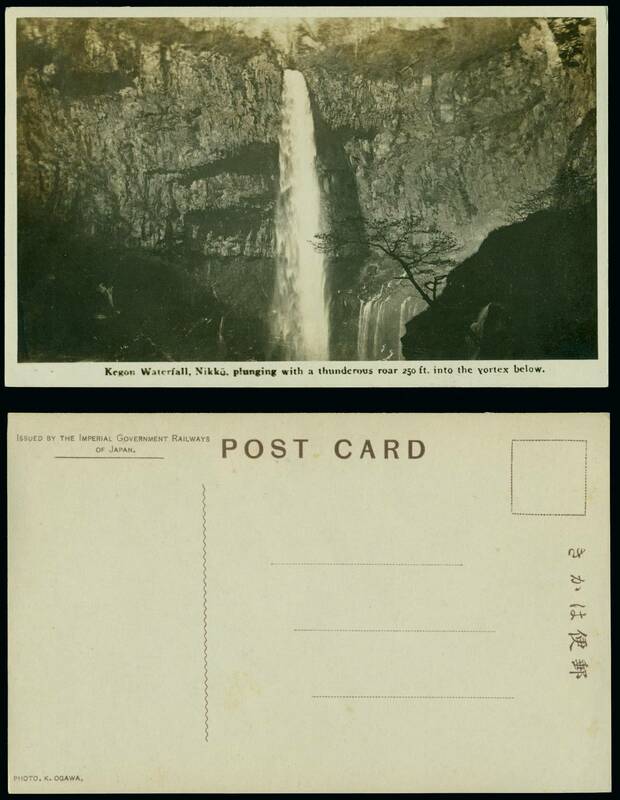 Comments: Features a scene by the river of the Kegon Waterfall, Nikko. 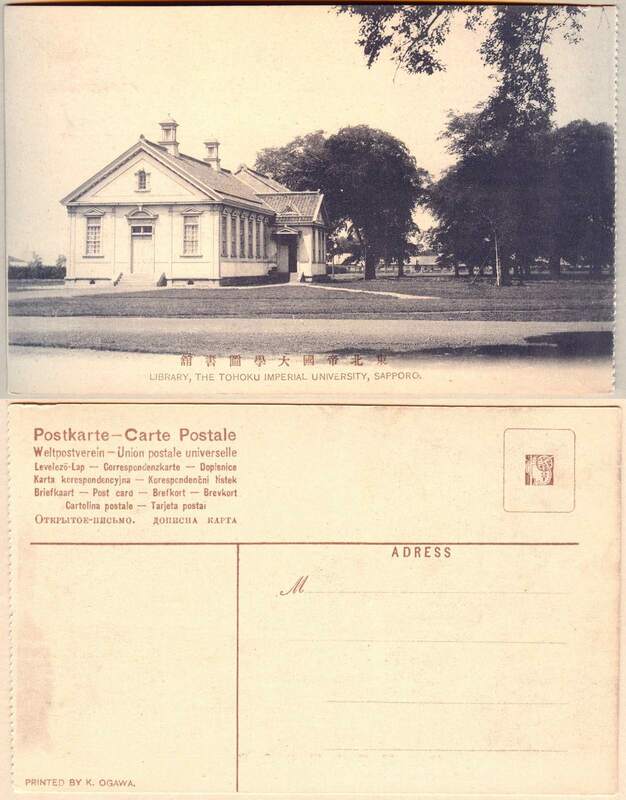 Real picture post card with real photograph ("Photo. K. Ogawa"). 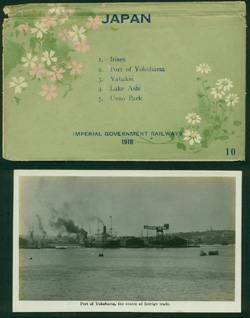 "Issued by the Imperial Governemnt Railways of Japan." 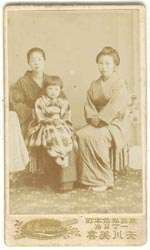 This is a part of the 1918 Imperial Government Railways of Japan set but I have not determined the set number. It is from Set 1, 4 or 7 however. 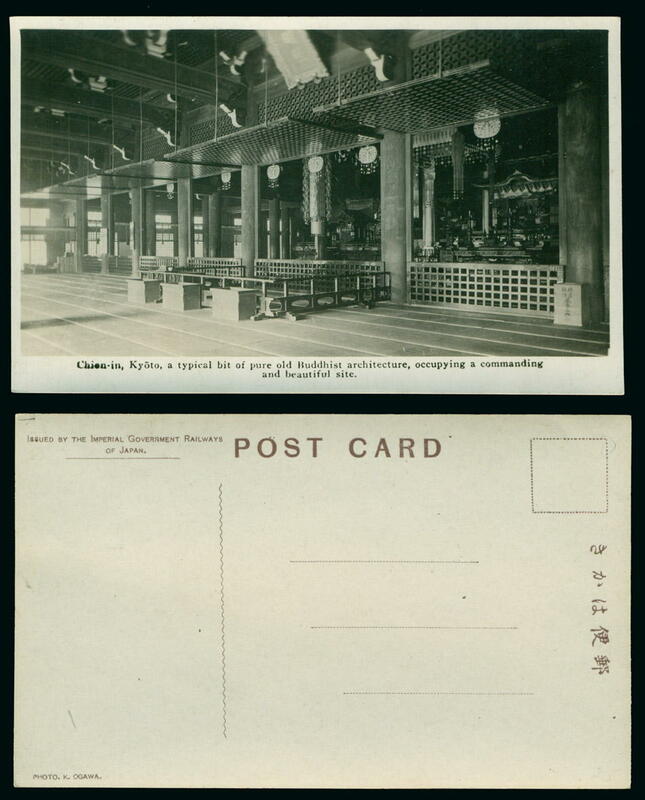 Comments: Features an inside view of the Chion-in Buddhist Temple, Kyoto. 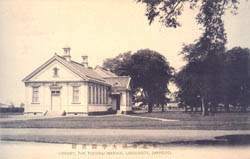 Real picture post card with real photograph ("Photo. 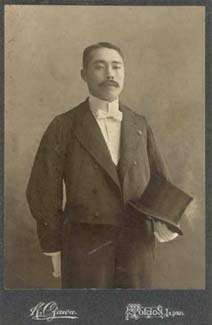 K. Ogawa"). 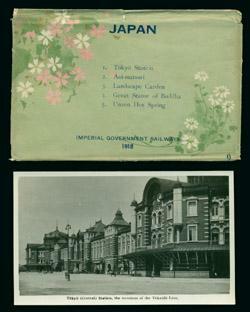 "Issued by the Imperial Governemnt Railways of Japan." 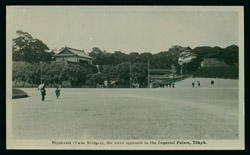 This is a part of the 1918 Imperial Government Railways of Japan set but I have not determined the set number. It is from Set 1, 4 or 7 however. 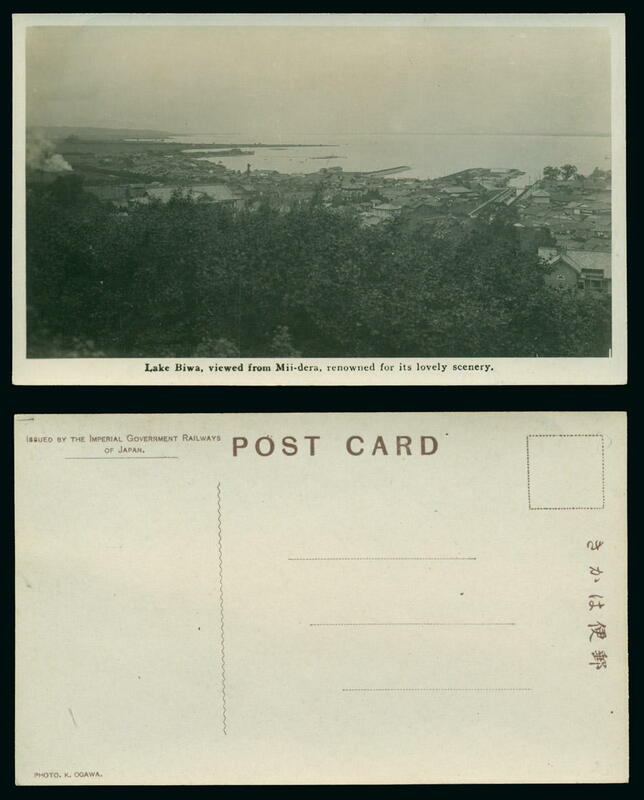 Comments: Lake Biwa as viewed from Mii-dera. 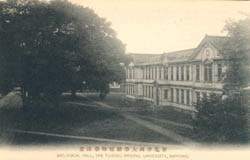 Real picture post card with real photograph ("Photo. 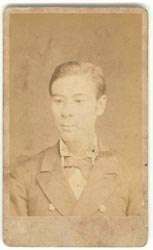 K. Ogawa"). 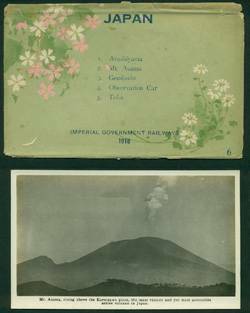 "Issued by the Imperial Governemnt Railways of Japan." 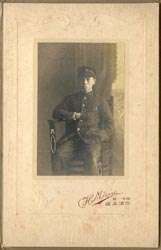 This is a part of the 1918 Imperial Government Railways of Japan set but I have not determined the set number. It is from Set 1, 4 or 7 however. 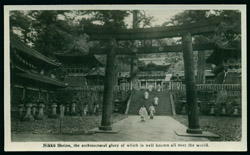 Comments: A veiw of the entrance to Nikko Shrine. 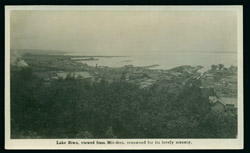 Real picture post card with real photograph ("Photo. K. Ogawa"). 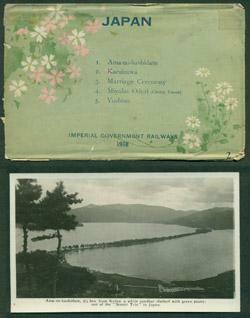 "Issued by the Imperial Governemnt Railways of Japan." 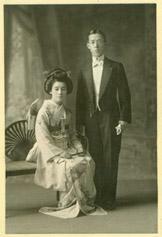 This is a part of the 1918 Imperial Government Railways of Japan set but I have not determined the set number. It is from Set 1, 4 or 7 however. 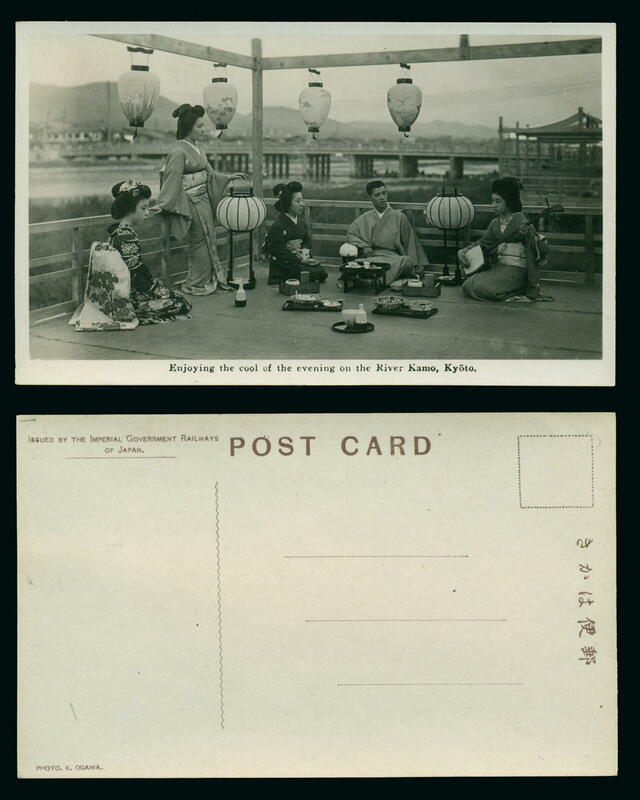 Subject: "Enjoying the cool...River Kamo, Kyoto"
Comments: Women entertaining a man outside with a view of the Kamo River, Kyoto. 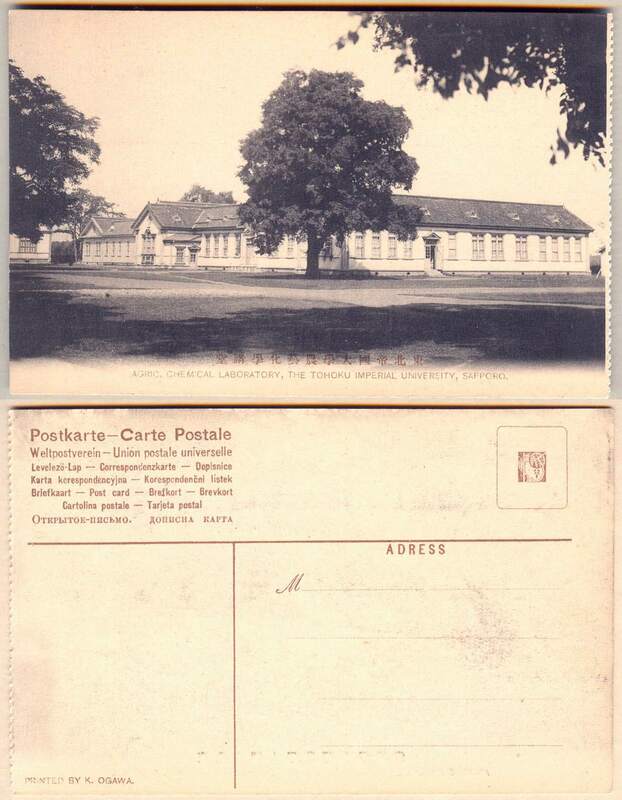 Real picture post card with real photograph ("Photo. 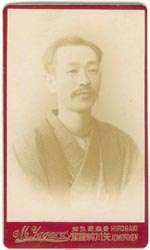 K. Ogawa"). 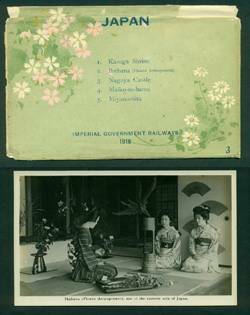 "Issued by the Imperial Governemnt Railways of Japan." 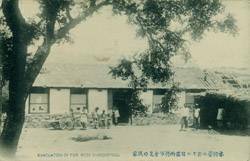 This is a part of the 1918 Imperial Government Railways of Japan set but I have not determined the set number. It is from Set 1, 4 or 7 however. Comments: A view of the Nihonbashi as you approach the main entrance of the Imperial Palace, Kokyo. 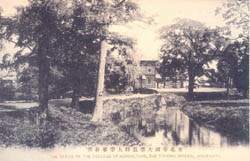 Real picture post card with real photograph ("Photo. 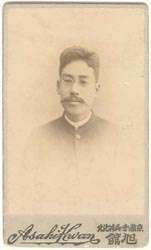 K. Ogawa"). 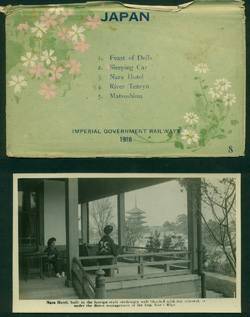 "Issued by the Imperial Governemnt Railways of Japan." 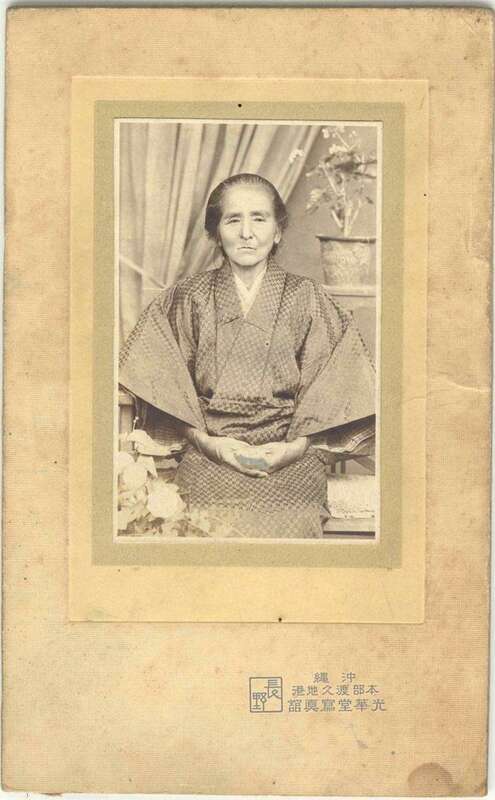 This is a part of the 1918 Imperial Government Railways of Japan set but I have not determined the set number. It is from Set 1, 4 or 7 however. 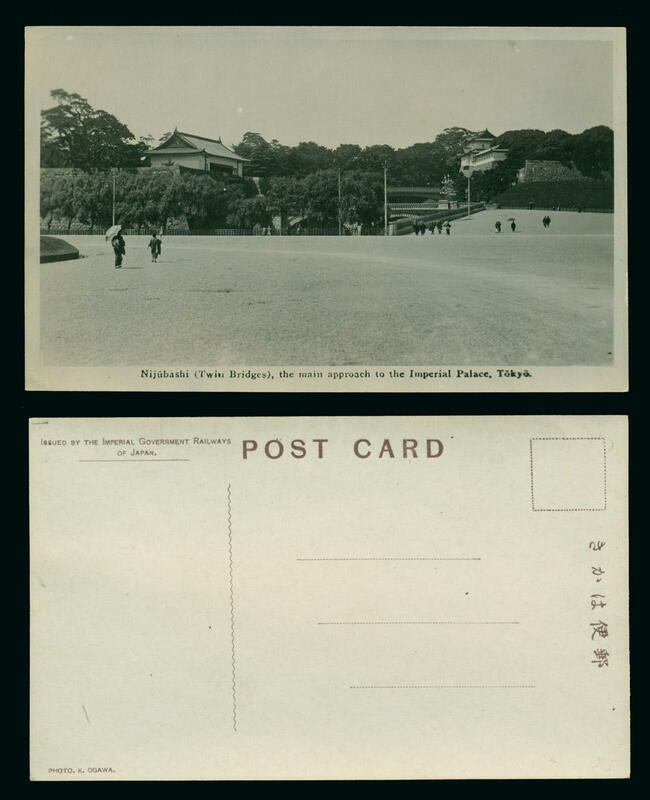 Japanese law contained very specific rules regarding format for privately printed post cards. Understanding these rules is very helpful in dating this type of material. Kjeld Duits on his excellent site, ikjeld.com (click here), outlines these rules. 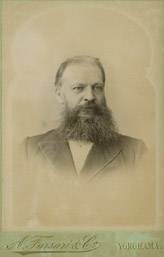 Photographer listed by Boyd - Izakura?:N/A. 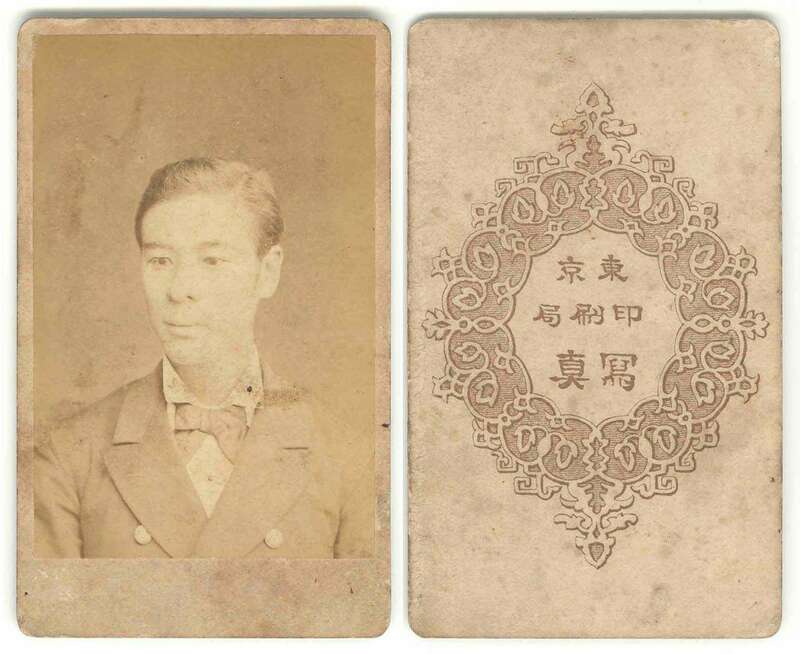 Condition: Very Good, appears to be a cut down cdv or cut from a albumen photograph plate in a book (like the Far East). Condition: Very Good. Front reads "Sarony - 37 Union Square" (New York City). 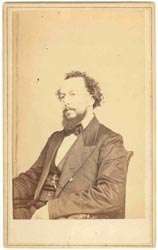 Bayard Taylor (1825-1878) was a noted travel writer. He accompanied the Perry Expedition to Japan from May-September of 1853. This image appears to have been taken a few years after he returned from the Expedition. No lettering or writing on the front. Condition: Fine. Manuscript "Bayard Taylor" at bottom but probably not Taylor's signature. The signature is definitely in ink, not printed on the card. 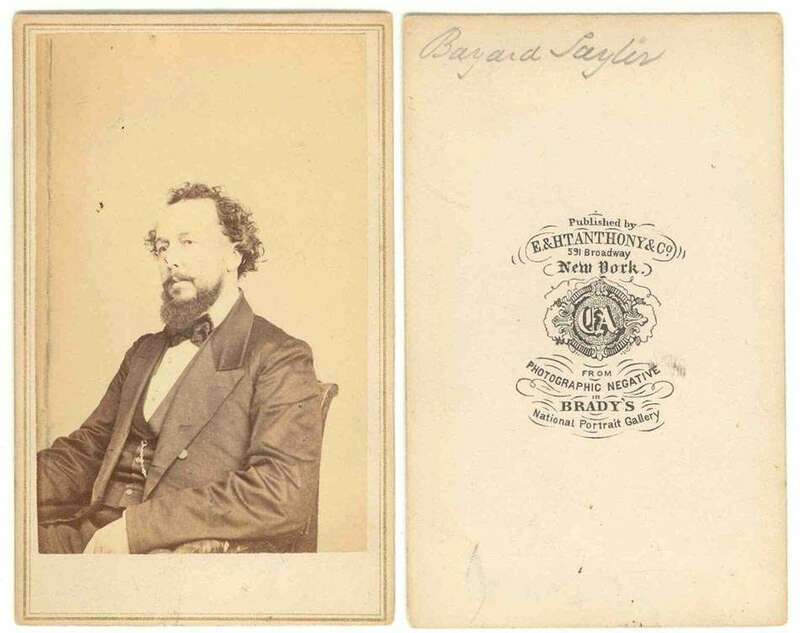 Bayard Taylor (1825-1878) was a noted travel writer. 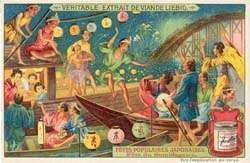 He accompanied the Perry Expedition to Japan from May-September of 1853. This image appears to have been taken a few years after he returned from the Expedition. Front reads "Sarony - 680 Broadway" (New York City). Condition: Fine. Back reads "C.D. Fredricks & Co., 587 Broadway New York". 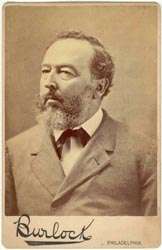 Bayard Taylor (1825-1878) was a noted travel writer. 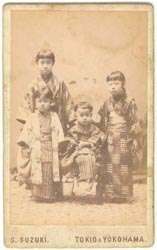 He accompanied the Perry Expedition to Japan from May-September of 1853. This image appears to have been taken a few years after he returned from the Expedition. No lettering or writing on the front. Condition: Fine. Manuscript "Bayard Taylor" in ink at top on the back. "Published by E. & H.T. Anthony & Co, 591 Broadway, New York, from Photographic Negative in Brady's National Portrait Gallery" on back. 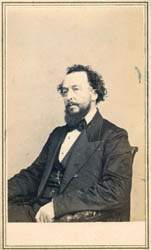 Bayard Taylor (1825-1878) was a noted travel writer. He accompanied the Perry Expedition to Japan from May-September of 1853. This image appears to have been taken a few years after he returned from the Expedition. No lettering or writing on the front. Condition: Very Good. Back reads "Published by E. & H.T. Anthony, 501 Broadway, New York - From Photographic Negative in Brady's National Portrait Gallery." 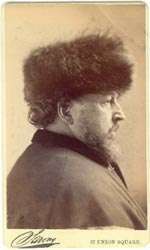 Bayard Taylor (1825-1878) was a noted travel writer. 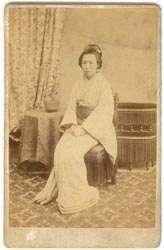 He accompanied the Perry Expedition to Japan from May-September of 1853. 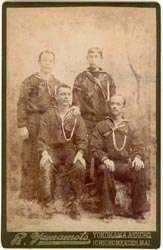 This image appears to have been taken a few years after he returned from the Expedition. No lettering or writing on the front. Condition: Very Good. The card appears to be trimmed down slightly on the left edge. All four corners are clipped. Back reads "Published by E. & H.T. Anthony, 501 Broadway, New York - From Photographic Negative in Brady's National Portrait Gallery." 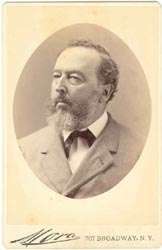 Bayard Taylor (1825-1878) was a noted travel writer. He accompanied the Perry Expedition to Japan from May-September of 1853. This image appears to have been taken a few years after he returned from the Expedition. No lettering or writing on the front. 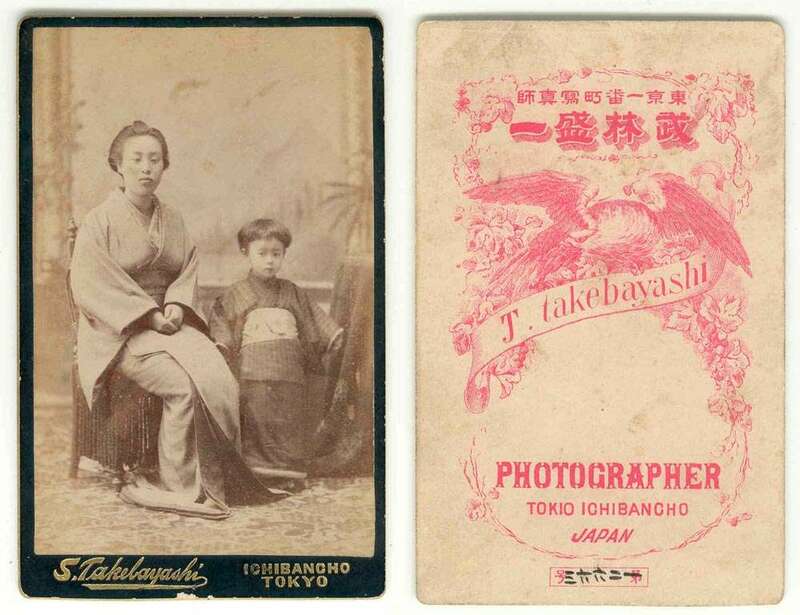 Studio Markings: "S. Takebayashi, Ichibancho, Tokyo" on front. Elaborate design with studio info on back, name on back "J. Takebayashi." Subject: Portrait from waist up. 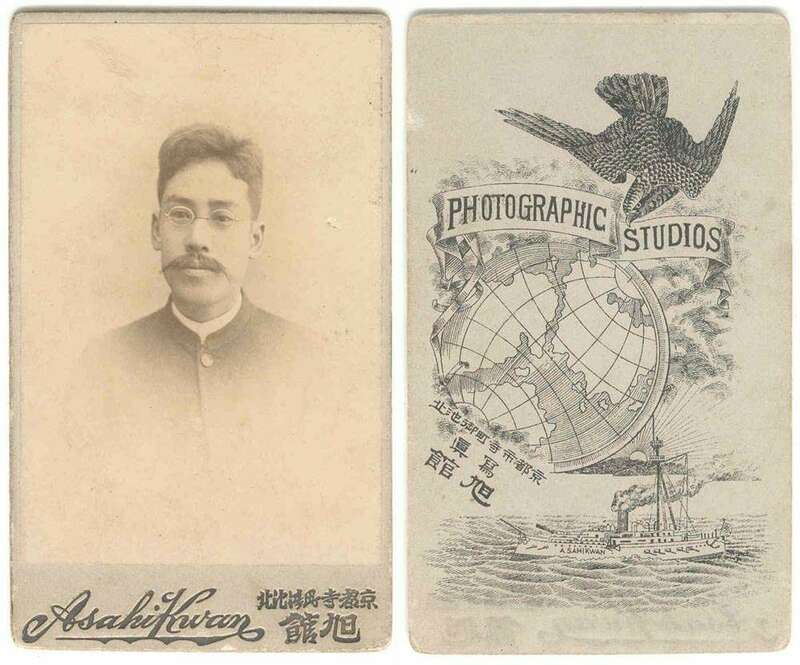 Studio Markings: "J. Saito, Hirosaki, Japan" on front. No markings on back. 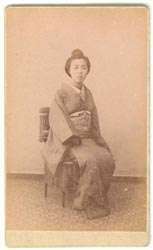 Photographer listed by Boyd - Izakura? : No. 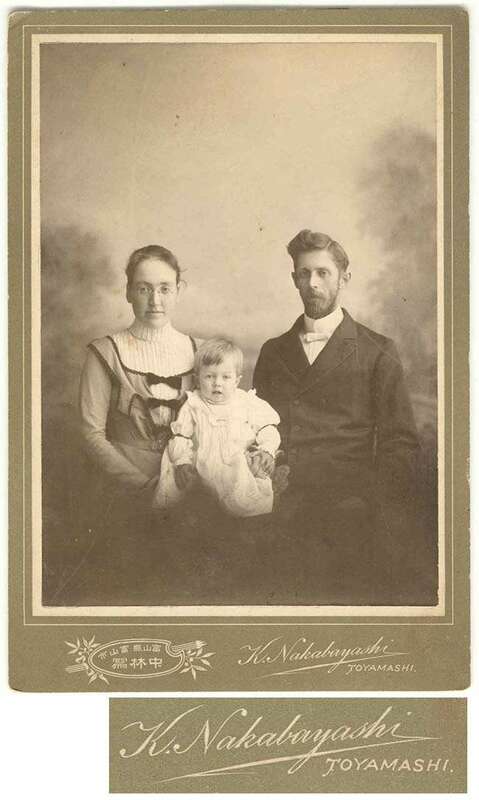 Subject: Three Standing and One Seated Portrait. Studio Markings: "S. Suzuki, Tokio & Yokohama" in English on front. Illustrated design on the back "Suzuki, Tokio Kudanzuka and Masagcho Yokohama, Japan." 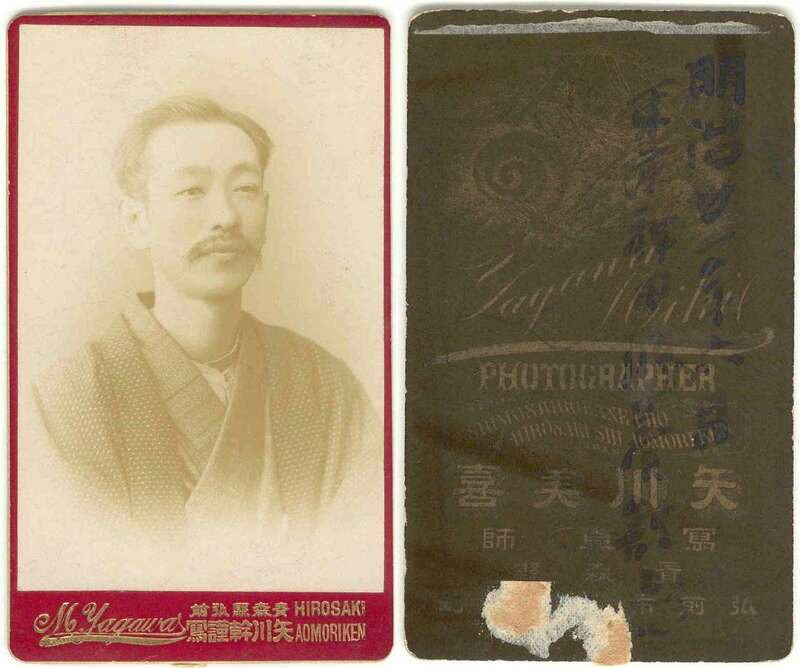 The date Meiji 24 (1891) is written in Japanese. Studio Markings: No inscription on front. Illustrated design on the back "Yagawa Mikie, Shimoshirokane-cho, Hirosaki-shi, Aomori-ken, Japan"
Studio Markings: "M. Yagawa" in English on front. Illustrated design on the back "Yagawa Mikie, Shimoshirokane-cho, Hirosaki-shi, Aomori-ken, Japan"
Studio Markings: Inscription on front, "Kobe"." Subject: Waist up portrait a young man. Studio Markings: "Asahi Kwan" in English on front. Japanese address of Kyoto. Elaborate design with studio info on back. 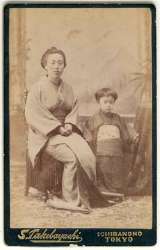 Photographer listed by Boyd - Izakura? 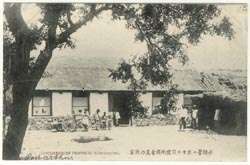 : Yes, probably Yoshida Seishichi who operated a studio in Kyoto called Ashi-kan. 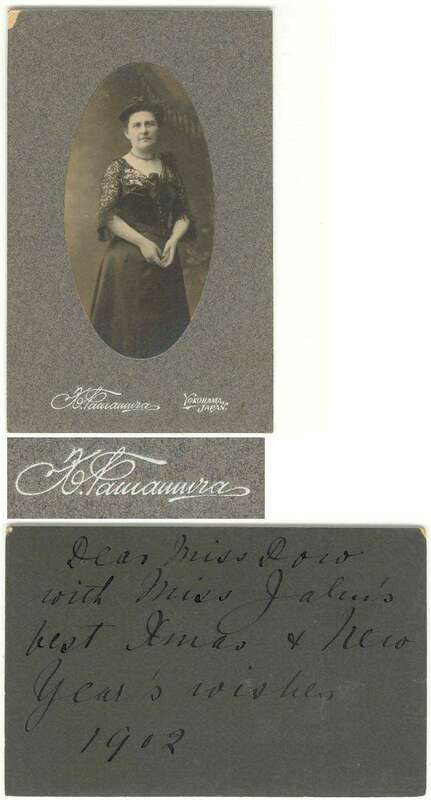 The cabinet card is approximately 2-3 times larger than the CDV. The usual size measures 4 1/4 x 6 1/2 in - 10.8 x 16.5 cm. 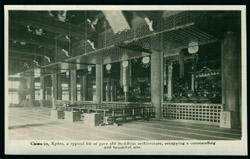 They were in use in Japan from the 1870s until approximatey 1910. Studio Markings: "Mora - 707 Broadway, N.Y."
Condition: Very Good. Manuscript "Bayard Taylor" in pencil at top on the back. 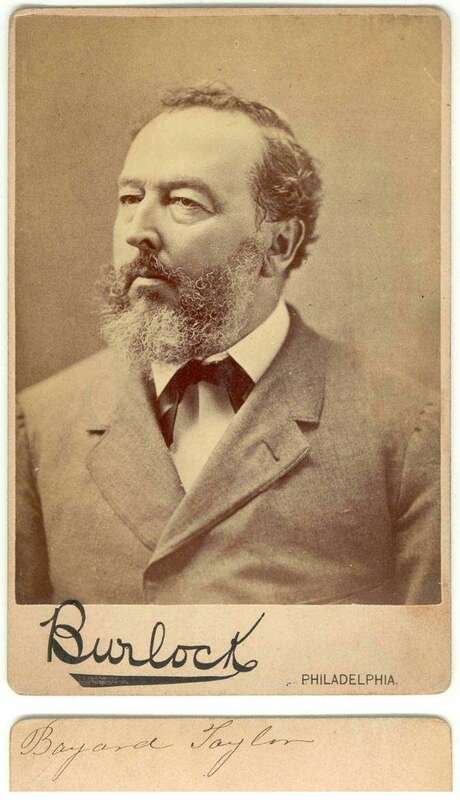 Bayard Taylor (1825-1878) was a noted travel writer. 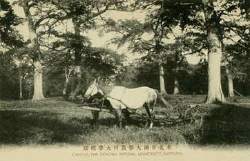 He accompanied the Perry Expedition to Japan from May-September of 1853. This image appears to have been taken several years after he returned from the Expedition. Studio Markings: "Burlock - Philadelphia"
Condition: Very Good. Manuscript "Bayard Taylor" in pen at top on the back. 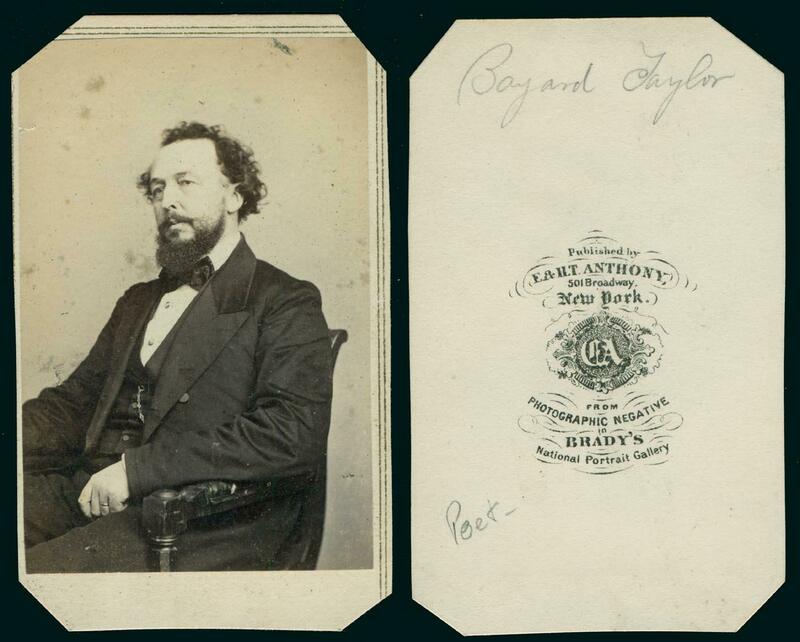 Bayard Taylor (1825-1878) was a noted travel writer. He accompanied the Perry Expedition to Japan from May-September of 1853. This image appears to have been taken a several years after he returned from the Expedition. #07014a -- $125.00 -- Baron de Groote, Paul A. 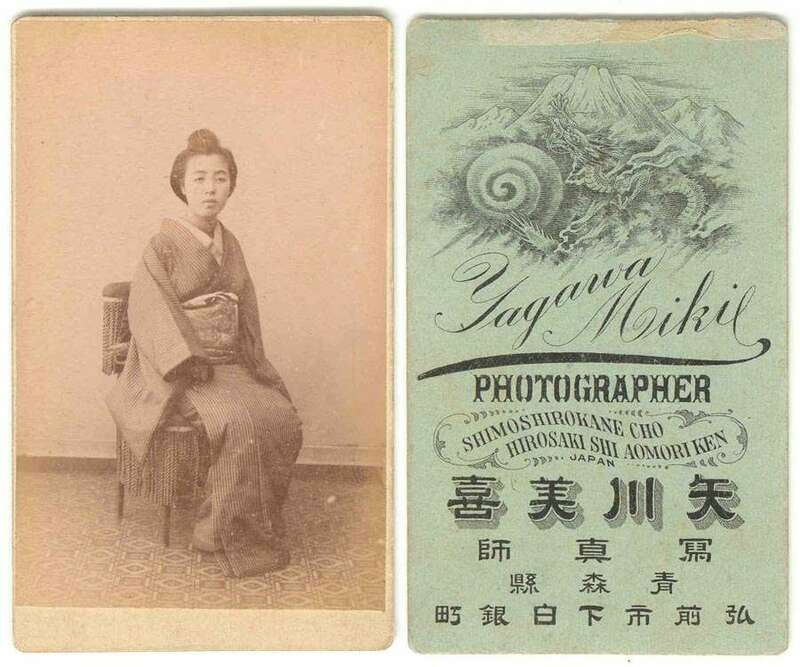 Studio Markings: "A Farsari & Co., Yokohama"
Photographer listed by Boyd - Izakura?:Yes. Condition: Good+. 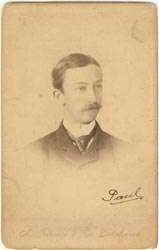 Photograph of Belgian diplomat Baron Paul A. De Groote. 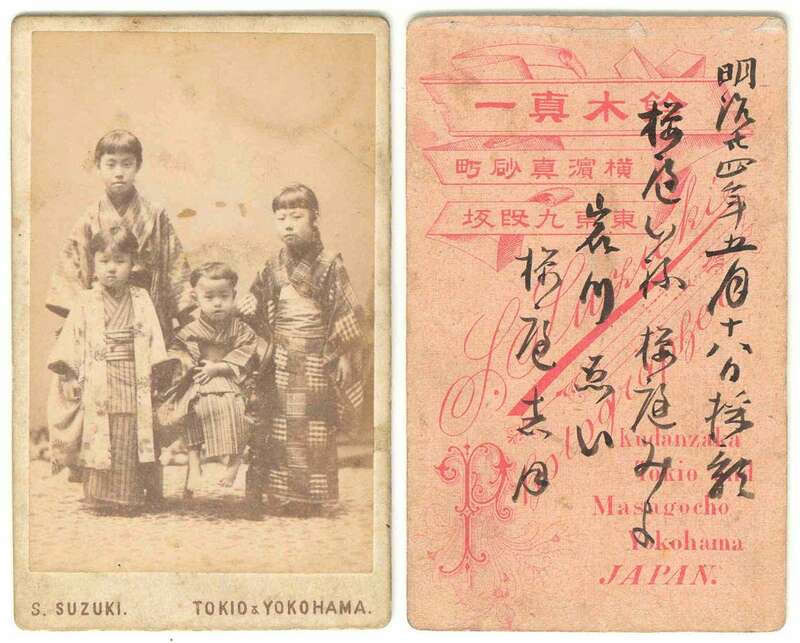 Manuscript annotation on back indicates "...au Japon, en 1890." Studio Markings: Front: "R. Yamamoto, Yokohama, Aioicho, Ichichome, Koen, Mai" -- Back: "R. Yamamoto, Photographic Artist, 1. 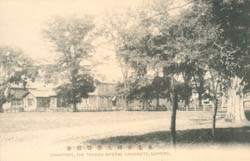 Chome, Aioicho, Yokohama and 7. Chome, Tamachi, Akasaka, Tokyo, Japan." Studio Markings: "A Farsari & Co, Yokohama"
Condition: Very Good. Lettering on front and edges in gilt. On back "Negative #2993." Condition: Very Good. Lettering on front and edges in gilt. On back "Negative #4870. 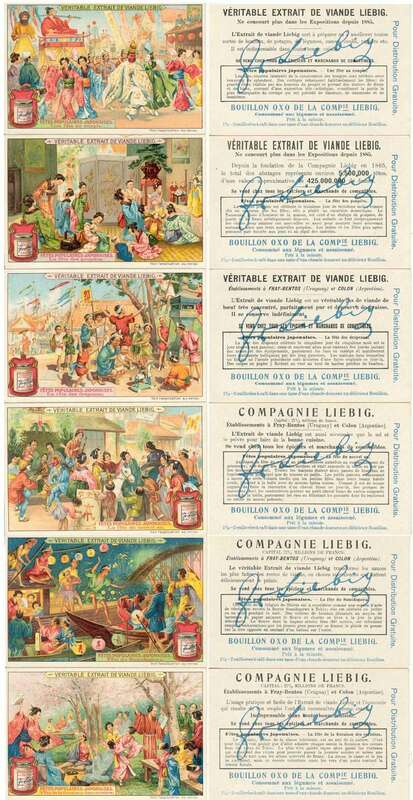 Manuscript inscriptions and the date 1 Jan 1897 on back." Condition: Good. Pin holes above and below the picture. Minor damage on back. Faint (not readable) writing on back. Silver on the hands, perhaps to mask a tatoo. Condition: Very good, upper left corner of card is chipped. Manuscript New Year's message dated 1902 on back. Studio Markings: No markings, front or back. Condition: Good. Crease at top which is a large tear on the back. Studio Markings: "T. Kojima, Yawatahama" No markings of back. Condition: Fair. Surface of photograph is deteriorating. Mount has numerous damaged areas, front and back. Studio Markings: "H. Miura" in English on front. Mounted to folder with rice paper tissue guard protecting the photograph. Numerous Japanese manuscript notations on the inside of the front cover which include the date of Taisho 8 (1919). 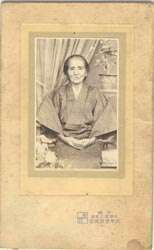 Condition: Very Good, complete set of 6 trade cards featuring scenes from the Japanese Fairy Tale, The Tongue-Cut Sparrow / Shitakiri Suzume. 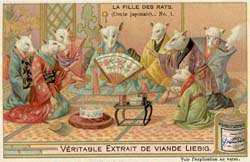 Condition: Very Good, complete set of 6 trade cards featuring scenes from the Japanese Fairy Tale, The Mouse's Wedding / Nedzumi no Yomeiri. 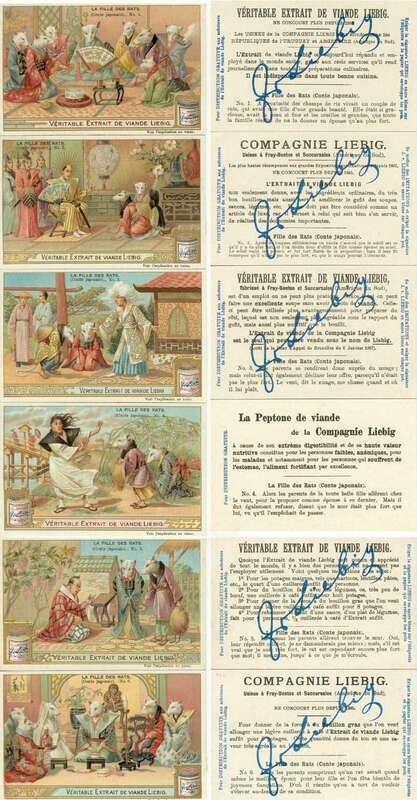 Condition: Very Good, complete set of 6 trade cards featuring popular Japanese Festivals. Subject: "New No. 9 Group of Girls." 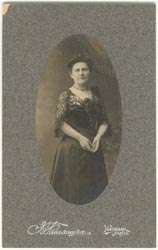 Comments: The back of the card is undivided dating it to the 1900-1910 time period. 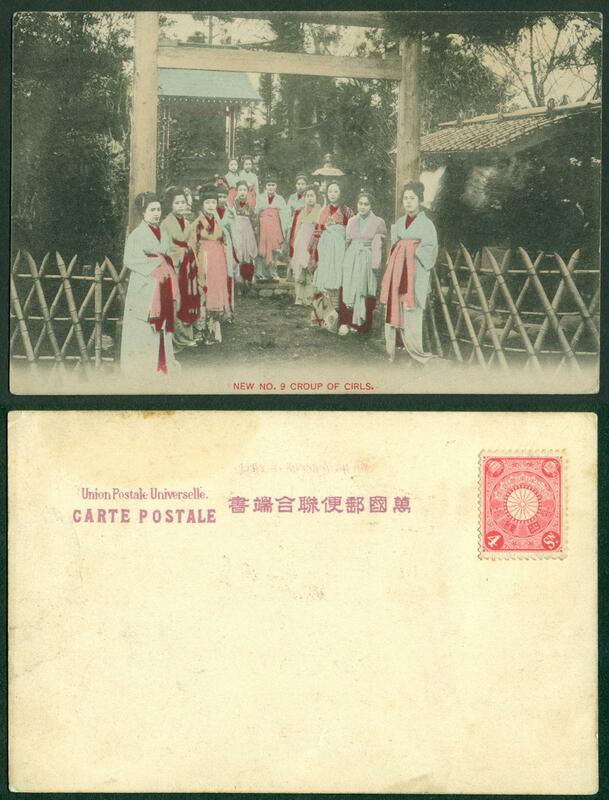 Comments: This is a set of hand colored collotype printed picture post cards. The cards are mint, not used. 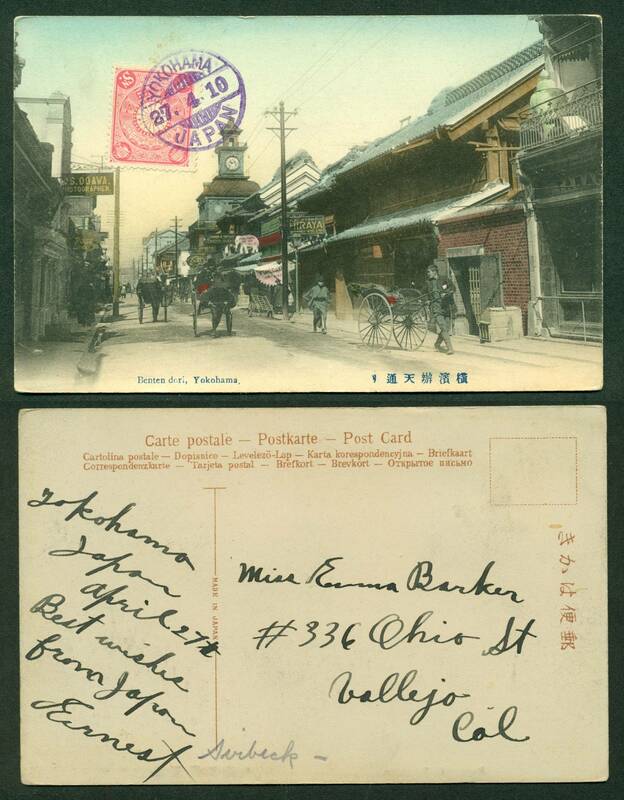 Comments: This is a hand colored collotype picture post card, the street scene shows the "S. Ogawa Photographer" shop on the left. On the right is a white elephant shaped sign for "Fukuyaya." 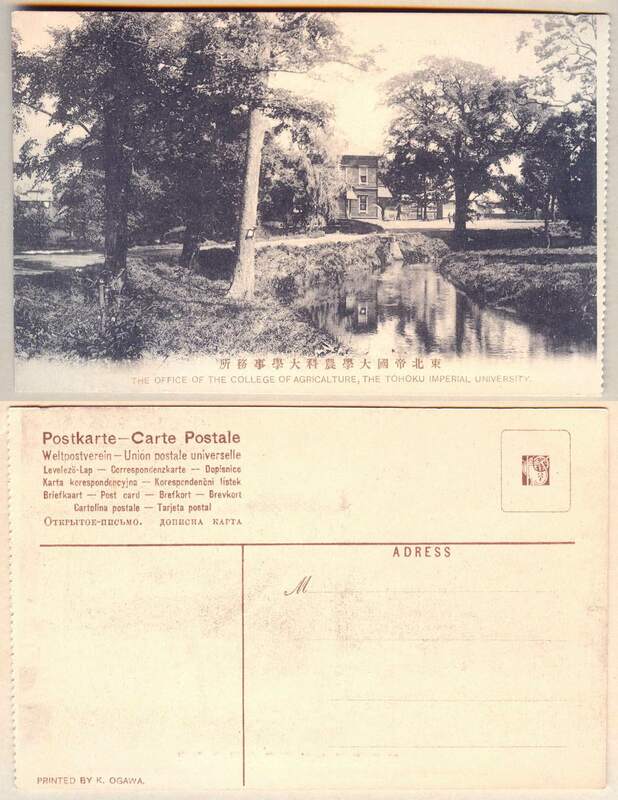 The clock tower is in the background in the area of the canceled stamp.